Adorned by radiant brass accents and colorful recycled glass beads, this mask of West African origin is sure to impress. Saeed Musah presents this stunning wall mask hand crafted from sese wood. Jama means "happiness" in a West African language. This item is exquisitely crafted. While a bit smaller than I anticipated, the artistic qualities of the mask are magnificent. 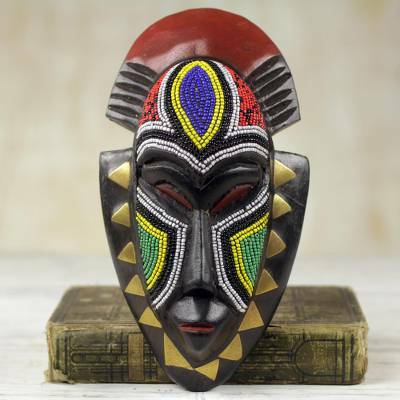 This was bought as a gift for a friend who is familiar with African art and artifacts, and there is no doubt that she will be delighted with it. "Found the perfect gift for USAF friend "
This is a beautiful mask. The picture doesn't do it justice.